There are many choices for pasta, not only shapes (spaghetti, bow ties, penne, etc. 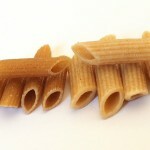 ), but also types of grain used to make the pasta. The desired shape is determined by the type of sauce you intend to use. Chunky sauces such as this one work well with the hollow tube pastas such as penne. 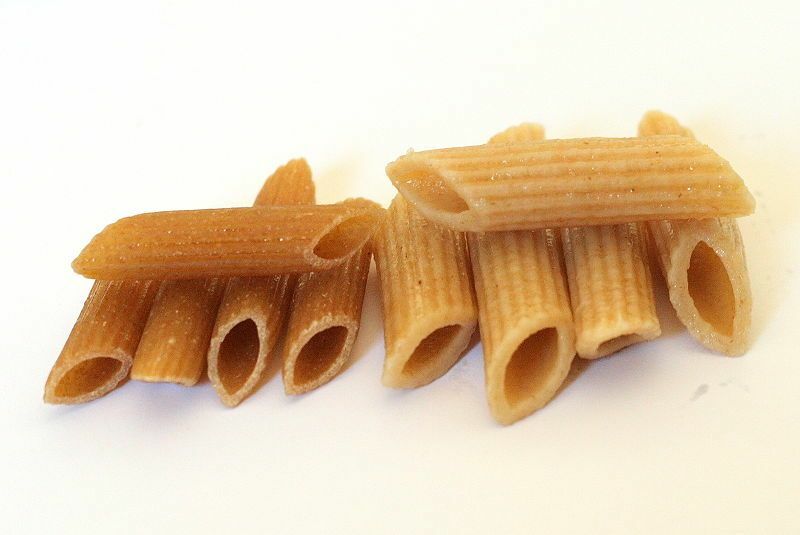 Penne are hollow tubes of pasta cut on a diagonal to make a quill-like point (hence the name of ‘penne‘ for pen). If you cannot find penne, use ziti or mostacioli, which are very similar. In a pinch you could use macaroni, but American macaroni is not as good. Some of the recipes are equally good with other shapes such as bow-ties. The most common grain used to make pasta is high-protein durum wheat that has been ground into a white flour or a semolina. But whole wheat and other whole grain pastas are becoming more popular, as people realize that whole grains are more healthful. And, as more people discover they are gluten intolerant, alternative grain pastas are becoming more prevalent. But, many of the nutrients are not available in the whole grain unless it is sprouted first (see Sprouting Grains & Seeds for more). Commercial pastas made from sprouted whole grain are available; one of the best is the Ezekiel brand. Most chicken & pasta recipes use cut up or shredded breast meat (white), but thigh meat is also delicious. If using breast meat, I highly recommend brining it before cooking, as it improves the flavor and helps this otherwise dry meat to retain moisture. You can also brine the thighs, and while they are naturally more moist than breasts, they will still improve in flavor by brining. I love this dish in the winter, when fresh tomatoes are pathetic, flavorless fruit, and outside the ground is covered with snow. Sun-dried tomatoes bring a bit of the sun into your bleak winter kitchen. While this recipe calls for sundried tomatoes packed in oil, you can also use your own dehydrated tomatoes. Refer to The Seasonal Chef (1) or Homecooking at about.com (2) for lots of tips on drying and using dehydrated tomatoes. To reconstitute your dehydrated tomatoes in oil for this recipe, place in a bowl and cover with extra virgin olive oil for 24 hours before using. Save the tomato-flavored oil to use in salad dressings, for example. Other dry, grated cheeses can be used instead of parmesan, such as Asiago or Romano. You can use Penne made from Semolina flour, whole wheat Durum flour, or Sprouted Grains; or, if you have gluten issues, try quinoa penne. If you can’t find Penne, use Ziti or Mostacioli. Serves 2. Brine breast meat for 30 minutes (brining thigh meat is optional). Rinse well, dry. Slice or separate into thin strips. Meanwhile, mince shallots, chop basil, grate cheese and drain sundried tomatoes. Cook pasta. Sauté chicken over medium heat in a bit of butter or olive oil until almost done, using cast iron skillet. Add shallots and saute 2 minutes, until soft. Add tomatoes and cook 2 minutes more. Stir in cream. Cook 2 minutes, stirring occasionally. Toss sauce, pasta, butter, parmesan basil and salt. Grate a bit of pepper over and serve immediately. This entry was posted in Dairy, Fat or oil, Herbs, Onion family, Pasta, Poultry, Sauteed, Vine veggies and tagged basil, chicken, cream, pasta, penne, sauteed, shallot, tomato. Bookmark the permalink.